Welcome to the Political Science Department at the United States Naval Academy. Our department offers a full complement of undergraduate political science courses for midshipmen to immerse themselves in the study of political phenomena and underlying processes and behaviors. Political science majors take introductory courses designed to provide an overview of major sub-fields in the discipline: American politics, comparative politics, and international relations. Our majors are also given a rigorous introduction to quantitative methods for social sciences. Midshipmen can then select elective courses to either survey the discipline, or design a cluster of courses that focus in a particular area (such as democratic processes, violent conflict, law, US government, regional studies, national security, emerging threats, etc.). A capstone seminar is required for majors in their 1/C (senior) year, involving completion of a substantial independent research project. The major is enhanced with foreign language requirements and humanities elective requirements. Midshipmen complete an intensive core of required science, engineering, mathematics, and professional courses. Midshipmen graduate with a Bachelor of Science degree in political science, ready to serve as leaders in the Navy and Marine Corps in every warfare community. Midshipmen also find additional opportunities to expand their education through more than 50 summer internship programs sponsored by the department. They are placed with a variety of agencies in the Washington D.C. area and abroad. Many of our department’s faculty lead midshipmen in regional expertise and cultural programs abroad. After graduation, political science majors frequently continue their studies through the voluntary, immediate, and UK graduate education programs. 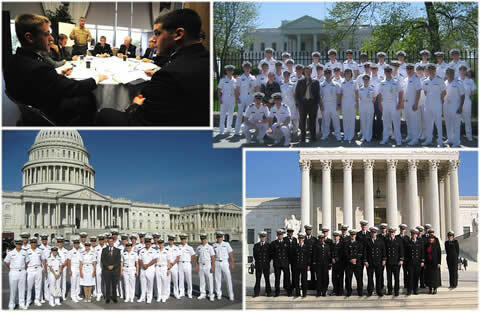 Midshipmen graduating with a Bachelor of Science degree in political science understand their role in the American political system and develop tools necessary to more fully understand the complex and dynamic global environment in which they will operate as officers in the Navy and Marine Corps.